First, we must disable the console mode of the Raspberry-pi. Indeed, by default the serial port can be used if it's connected with a terminal device (Such as a Minitel for French people ). The waveform (measured between GND and TXD) looks like this. To verify at the same time the RX and TX functions, connect the 2 pins RXD and RXD together. And with the same code python, you are going to see on the display(screen) the data's received on RXD(echo). It's the data's transmitted by TXD. You can also connect directly the serial port of the SVXLink card with the serial port of a PC. 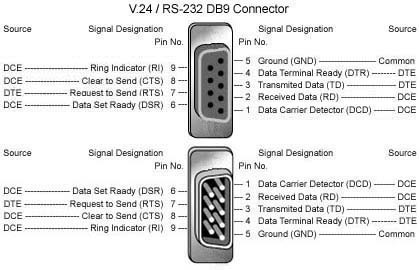 The connection description of a port 9 points DB9 is the following.